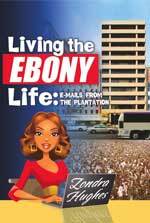 The transitioning media climate is only partially to blame for Ebony's woes, argues former Ebony Associate Editor, Zondra Hughes author of Living the Ebony Life: E-Mails from the from the Plantation, (www.livingtheebonylife.com), now on sale. Delivered in a humorously punchy narrative, EBONY LIFE also includes celebrity encounters, the rivalry between Ebony and Jet editors, and a floor-by-floor tour of the elaborately decorated building. Zondra served seven years (1999-2006) in the Ebony editorial department, widely regarded as 'The Plantation' by company insiders due to the quirky company policies such as assigned lunchroom seating. In 2006, Zondra's whistle-blowing memo established a precedent as the first Ebony Associate Editor to publicly address the practice of workplace bullying at the company. Zondra was fired but refused the company's severance offer, which included a clause not to pursue legal action. Zondra Hughes made her literary debut on the outrageous and over-the-top Wendy Williams smash hit, Ritz Harper Goes to Hollywood! (Pocket Books/Karen Hunter Publishing). She is the editor of N'Digo, and a featured blogger for The Huffington Post and ChicagoNow. The author resides in Chicago.